Philadelphia Mayor Jim Kenney on MSNBC's "Morning Joe" on July 25, 2016. With the 2016 Democratic National Convention officially underway in Philadelphia, Mayor Jim Kenney is embracing the national spotlight as his administration hosts its first major event. For months, speculation about the tone and safety of political protests has dominated coverage of the city's preparations, particularly in the wake of recent violence over patterns of racial injustice and police brutality in the United States. Appearing Monday on MSNBC's "Morning Joe," Kenny spoke forcefully in defense of the Black Lives Matter movement, tracing its validity to a history of subjugation and disenfranchisement. After fielding a number of questions about the logistics of the event, Kenney took a more pointed query from co-host Willie Geist. "One of the things we'll hear a lot about tonight — we'll hear about it this week, as a matter of fact — [is] Black Lives Matter. We'll hear mothers of victims of police violence," Geist said. "How have the events of the country over the last couple of years ... changed the way you talk to your police about dealing with your community?" Kenney quickly replied: "The issue of Black Lives Matter is that they do because they haven't mattered in our country over the history of law enforcement and in the criminal courts, and in the way people have been treated from the 1600s up until now." Geist later pressed Kenney on the denial of a DNC protest permit to the Poor People’s Economic Human Rights Campaign led by activist Cheri Honkala. Kenney said the permit couldn't be issued for Broad Street because it was already held by another group. Since Kenney took office in January, some activists have maligned him for seemingly modifying his views on the practice of stop-and-frisk policing in black communities. 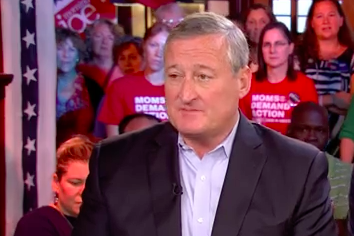 At a heated town hall meeting in May, Kenney apologized for the city's "unconstitutional stops," which had been targeted and condemned in a report earlier this year from the Pennsylvania American Civil Liberties Union. Kenney pledged to fully eliminate stop-and-frisk over time, adding that his work to decriminalize marijuana has greatly cut down the number of African-American arrests. Recently passed legislation also downgraded several nuisance crimes to civil citations, greatly minimizing the prospect of mass incarceration during protests in Philadelphia. On Tuesday night, several members of Mothers of the Movement — including Gwen Carr (mother of Eric Garner), Sybrina Fulton (mother of Trayvon Martin) and Lezley McSpadden (mother of Michael Brown) — will speak alongside former president Bill Clinton at the Wells Fargo Center.